In a working paper from the Bank for International Settlements, Guonan Ma and Robert McCauley consider the relative closure or openness of the world's two largest emerging economies, China and India; and conclude that, contrary to the findings of most academic studies, India is actually more open than China right now, but that both countries are progressing towards being more financially open. This is a technical paper and will leave the casual reader scratching their heads, but the authors make a number of interesting observations through the course of their dissertation, and for those of us wondering exactly when, or perhaps if, these two economies will open up fully, it holds much of interest. India comes out ahead of China, in terms of financial openness, on six of the eight measures used by the authors to determine how financially open an economy is. One of the most obvious measures of a currency's openness is to look at forward foreign exchange rates within the country versus offshore. Capital mobility, the authors point out, ensures that any differential between onshore and offshore rates in an open economy is arbitraged away pretty swiftly. China's onshore forward currency market kicked off in 2003, but the rules state that traders inside China can only access the domestic forward currency market when they are actually fulfilling a "real" transaction in the real world. So you need a proper market transaction backed by documentation. Of course, in the open, offshore market, all comers can transact, which automatically creates a price differential. The authors found that while there were some quite sizeable gaps, after 2008 the average of the gaps for both the renminbi and the rupee fell noticeably, suggesting that both economies have become somewhat more open since 2008. India is ahead on this measure, but China appears to be catching up. Another measure compares short-term interest rates onshore and offshore, which some academics regard as a good test of capital mobility (i.e., no gap, or one that is swiftly arbitraged away, is characteristic of an open currency since capital flows to the better rate). Prior to 2010, when China allowed offshore renminbi banking, yields had to be inferred from non-deliverable forward contracts (NDFs). The NDF market originated in the 1990s. Instead of settling the whole contract the counter-parties simply settle the difference between the currency spot price and the forward price, on an agreed notional principal. The whole system was developed to cater for trading in emerging market currencies with capital controls, where it was simply not possible to deliver the forward contract offshore. NDFs are usually quoted with the US dollar as the reference currency and settlement is generally in dollars as well. Banks acting as market makers for NDF contracts typically quote forward rates from between one month to a year ahead, with the IMM dates (the four quarterly dates of each year that are used for most futures and options contracts) as the target points. Again, looking at the gap between onshore and offshore rates for India and China, the evidence points towards India being more open (i.e. a smaller positive gap between the relative cost of onshore and offshore rates), but with China catching up. At the same time, the fact that there is a gap shows that both currencies are still relatively closed by comparison with say, euro/dollar trades, where the rate in both Frankfurt (offshore) and New York (onshore) are identical. 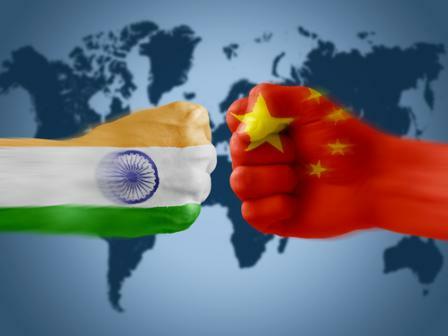 The authors point out that both China and India have run "natural experiments" by allowing firms to list their shares on both domestic markets (Shanghai and Mumbai respectively) and Hong Kong and New York. Although onshore and offshore trades take place in different currencies, a free flow of capital would tend to arbitrage away any price differentials between the two pretty quickly. In fact the authors found that Chinese shares tend to trade at a premium in Shanghai over their prices in Hong Kong or New York, i. e. Chinese investors would love to be able to buy these shares directly in New York were it not for currency controls. Before the crash, Chinese company shares listed in Hong Kong were on average 45 percent cheaper than the prices quoted in Shanghai. This has since narrowed to 15-25 percent. On measures of the internationalisation of the two currencies (the extent to which the currency is used for trade outside the home country) the rupee "has proceeded as far or even further than the much discussed renminbi internationalisation". The authors point out, however, that their study is based on the three yearly survey by the BIS, and the most recent survey, not analysed in their report, is expected to show a major increase in renminbi internationalisation. What the study seems to show is that currency controls and restrictions in both China and India are being slowly eroded by multi-national firms inside both countries using intra-firm transactions to arbitrage onshore and offshore markets, though Indian firms are generally more advanced than Chinese firms, with the latter being at an earlier stage in their multi-national operations. The authors also take issue with various commonly accepted formula for measuring openness and stress that research henceforth needs to take account of pragmatic, de facto issues. All of this will be just so much academic speak to most business folk, but the takeaway is that both countries have moved quite a long way towards openness since the 2008 crash, but both still have some way to go. An openly traded currency with a free floating exchange rate is one of the hallmarks of a mature, advanced economy, and both countries are headed in that direction, but quite when they will get there is anyone's guess. Which is more open financially, India or China? is republished with permission from the QFinance Blog.